Using up to date equipment the fully trained staff member repairs pallets to meet the quality standards set out for them. 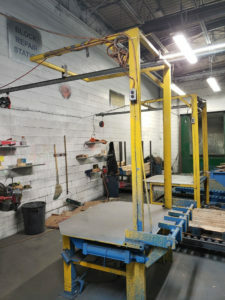 Once a pallet is on the repair table, the operator visually inspects the pallet looking for non conformity or defects. Once a defect is found the operator will choose one of their many quality tools to either clean up or remove the defect noticed - this can happen multiple times on a single pallet. After the repair is completed, the operator will inspect the pallet once more before sending it off to its final destination .